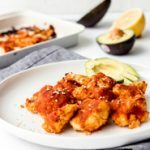 A sweet ‘n healthy spin on traditional buffalo wings – these are made using cauliflower instead. 1 cup almond flour (110g) – I used this brand from Amazon. Optional sesame seeds to sprinkle on top for serving. Preheat oven to 425F. Add all dry ingredients (listed under batter) to a mixing bowl and whisk. Then add all wet ingredients form a batter, if it seems too watery, let sit for a minute to allow it to thicken up. Dip cauliflower pieces into batter making sure to coat all sides evenly and place on baking sheet. Bake in the oven at 425F for 30 minutes. Prepare sweet and sour sauce: Add all ingredients to a blender and combine. Add the sauce to a mixing bowl and gently toss roasted cauliflower to coat with the sauce. Place coated cauliflower pieces back into the oven at 425F for another 15 minutes, or until crispy. The longer you leave them in the oven, the drier they will be so keep that in mind. Once roasted, sprinkle sesame seeds on top (optional) and serve with extra sweet ‘n sour sauce if you have left over. Enjoy! This recipe is perfect for one large cauliflower or 1 to 2 small sized cauliflowers. If you are making this for a large group (more than 2 people), double the recipe.